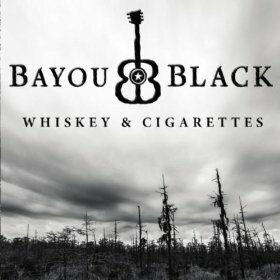 Bayou Black – Whiskey & Cigarettes (Independent)A couple of years ago we reviewed Bayou Black’s debut EP “Strangled Up In Vines”, and we were very much taken with the band’s melodic prowess and their gritty way with a hook. Since we last touched base with the Austin, Texas band, they’ve had more than their fair share of drama. Guitarist Tony Kountoupis underwent neck and spinal surgery midway though the EP’s recording process, and drummer Jeff Brickley moved out to California, and doesn’t appear on the new songs at all. Released in June, “Whiskey & Cigarettes” is their new four-track collection of original material, and they hit their stride immediately with opening cut “Dead & Gone”. Its musical mélange of literate songwriting, a catchy chorus, and robust, rootsy guitars, brings to mind a host of much-loved artists, from Tom Petty and Marshall Crenshaw, to Iron & Wine and Jay Farrar. It’s a fine start. They continue with “Look in Her Eye”, and it’s considerably more reflective than its predecessor, though no less appealing, and “Get Back” rolls along with an easy rhythm and uncomplicated, feel good vibe. They end with “Sorry”, where their Beatles’ influence comes to the fore, and guitars and narrative collide, creating sparks aplenty. Review: Bayou Black – Strangled Up In Vines EP Bayou Black – Strangled Up In Vines EP (Independent) When it comes to convoluted histories, some bands put in a lot more effort than others. Bayou Black is one of those bands. Siblings Chris and Tony Kountoupis, and bass player Sevon Moore, all played together in Austin, Texas rock band Fauverdog. It was going well - they were gigging regularly, the Austin Chronicle gave them an award, but when the drummer departed, the band folded. The brothers formed a couple of other groups, played solo shows and generally kept themselves busy, until Moore came back on the scene in late 2007, and Bayou Black were formed. And now, to drag things ‘round full circle, Fauverdog drummer Jeff Brickley returned to Austin in 2010, and can be heard drumming here. Honestly, you couldn’t make it up. So, the four-track “Strangled Up In Vines” EP is their debut recording, and considering their collective past, it must have felt like a long time coming. The brothers provide the compositions, and they write melodic pop-rock songs with no shortage of hooks and plenty of heart. Here they open with “The Bet”, a mid-paced acoustic number, with a cool, Paul Westerberg-esque edge, and a barbed chorus that’ll have to be surgically removed. “Ain't the Same” burrows just as deep, and “Evil Deeds” is even better; the sort of song, had it been written in 1965, would have become a garage band staple. As it is, it wouldn’t sound out of place on one of Not Lame’s acclaimed power pop compilations. www.bayoublackmusic.com Phil S.